The Ohio State University Department of Physics is one of the university’s largest and most diverse departments conducting world-class research. It is a top 25 physics department in the country, providing the fundamental core curriculum for all of the sciences at Ohio State. 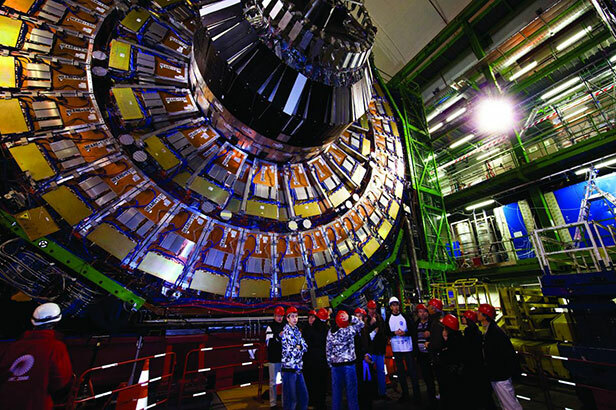 The Large Hadron Collider, at the European Organization for Nuclear Research (CERN), is the world’s highest energy accelerator used by physicists to study the smallest known particles—the fundamental building blocks of all things. It is made up of intersecting rings 27 km in circumference and spans the border between Switzerland and France about 100 meters underground. Ohio State is the only institution in the United States collaborating on three of the four largest LHC experiments, ALICE, ATLAS and CMS, to analyze the myriad of particles produced by the collisions in the accelerator. Astronomy and physics professor Christopher Hirata is the first faculty member from Ohio State to receive a New Horizons in Physics Prize, an award given alongside the annual Breakthrough Prizes, which have come to be known as the “Oscars of science.” Hirata received the prize in recognition of his “fundamental contributions to understanding the physics of early galaxy formation and to sharpening and applying the most powerful tools of precision cosmology.” His work focuses on dark matter and dark energy, which are believed to control how galaxies form and how the universe expands, and his research has drawn together elements of big data, device engineering and theoretical physics. The Science Center for Advanced Research on Lasers and Engineered Targets. We are one of only a handful of universities in the nation to have such an ultra-intense laser facility. The faculty in the High Energy Density Physics group focuses on experiments using basic laser physics that will help advance breakthroughs in fusion energy, cancer therapy and national security. In 2011, three physics undergraduates received National Science Foundation (NSF) Graduate Fellowships, an undergraduate was selected for the Winston Churchill Scholarship — one of only 14 in the country — another undergraduate was awarded a Fulbright Scholarship; two graduate students received NSF Graduate Research Fellowships. Houses leading efforts in studies of dark energy, dark matter, the origin of cosmic structure and the highest energy particles in the universe. An NSF funded Materials Research Science and Engineering Center focusing on integrated research on emergent materials and phenomena in magnetoelectronics, creating new paradigms in computing and information storage. Focuses on research in electronic, magnetic, and organic materials to advance the discovery of new forms of energy. Its nanosystems laboratory advanced material characterization and fabrication tools including focused ion beam/scanning electron microscopy, e-beam lithography, nanomanipulation, EDS X-ray microanalysis, X-ray diffractometry, SQUID magnetometry, atomic force/magnetic force microscopy, low temperature magnetotransport measurements, Magneto-optical Kerr Microscopy, Thin Film Deposition and Langmuir-Blodgett trough monolayer deposition.